Does this mean dealerships are going to carry the Watkins Glen rims now? Any idea how much they would be to buy off VW? Any idea when they'll be in stock? Besides the leather, what am I missing that makes this so cheap? Eventually I guess, most likely once the car arrives. Cars are due to arrive in March. Wow, that Wolfsburg edition GTI is EXACTLY what I was looking for back when I bought my TDI, wanted the kessy, and tech stuff but can't stand leather, plus the Jacky cloth is soo damn cool. If I'm not mistaken, for some reason the MSRP of a similarly equipped regular 2013 GTI (with tech package) before PDI, fees and taxes seems to be 3400 more than this. Besides the leather, what am I missing that makes this so cheap? Wow is right. That's package should have been available from the start. Time for me to put my plans on hold and bring my car back to stock in order to swap in March! They will be on KIJIJI and such next summer anyway... Look at all the detroits on KIJIJI. FYI - Wolfsburg Edition models won't be released for at least 60 days. Some are already at port (NS) but that doesn't mean VW will release them. I'm hoping early March, however it will most likely be mid to end of March. I heard Feb 18th for my delivery. My WBE is sitting in Emden waiting for the ship to arrive, load and leave on Feb 6th. Then it's to Halifax by Feb 15th... Then it's just going to sit there? Then it's just going to sit there? Yes, it happens more often than not. Word from the memo I received last week, indicates 60 days. During the month of February VW will offer a $1,000 cash trade allowance to purchasers of any new 2013 model year Volkswagen Golf 2.5, TDI and GTI models (R not included). To qualify, all customers purchasing an eligible vehicle who trade-in any vehicle with a value of $1,000 or more. These are for ON, not sure what they're in QC. 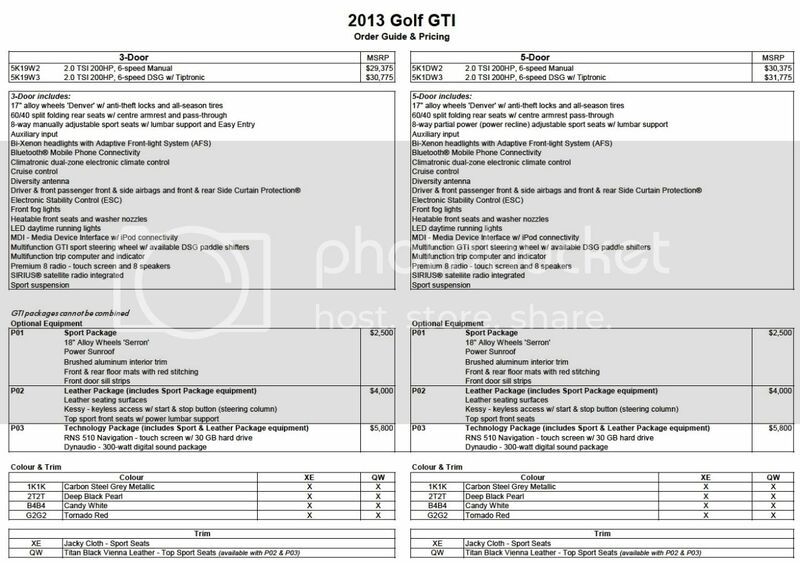 Hi Alex what is the finance rate on the 2013 WB golf on a 72 month term? Also say I put down a deposit on a WB golf back in Jan would I get stuck with these new finance rates?? Or the one that was available when the agreement was signed? It's 4.9% for 72 and 5.9% 84 months. We didn't have rates for the WB back in January. There's no rate protection with VW.